We were atlasing in East Providence yesterday, in the woods behind Gate of Heaven Cemetery. We saw some interesting things, some saved for a later post. For today, however, I want to share with all of you who have ever had a bad hair day. This bird certainly did. This is a Northern Flicker, a type of woodpecker. You can tell, in this view, by the black crescent shape near the neck, as well as the spots on the breast. Well, in a well-groomed bird you can see the spots! Another identification mark is the red marking on the back of the head, seen here. Unlike many other woodpeckers, red on the head does not distinguish males from females. For this species, the males have a black malar stripe, which this and other females lack. The malar stripe extends backward from the base of the bill, and is named for the malar, or jaw bone. Flickers also have a white patch at the base of the tail, visible here. This feature is frequently seen as the bird flies up from the ground, where it has been foraging for ants. That’s right, flickers seem to spend more time on the ground than they do in trees, since ants are their primary food source. The tail, as with all woodpeckers, is very stiff, and the tail feathers end in sharp points. All of that enables woodpeckers to use the tail as a third leg to steady themselves as they peck wood. Woodpeckers excavate nesting holes in dead trees. (There is an exception, the Yellow-bellied Sapsucker, that excavates nest cavities in live trees.) They may make several nest cavities before settling on one to actually use. The flicker’s tail is visible here. 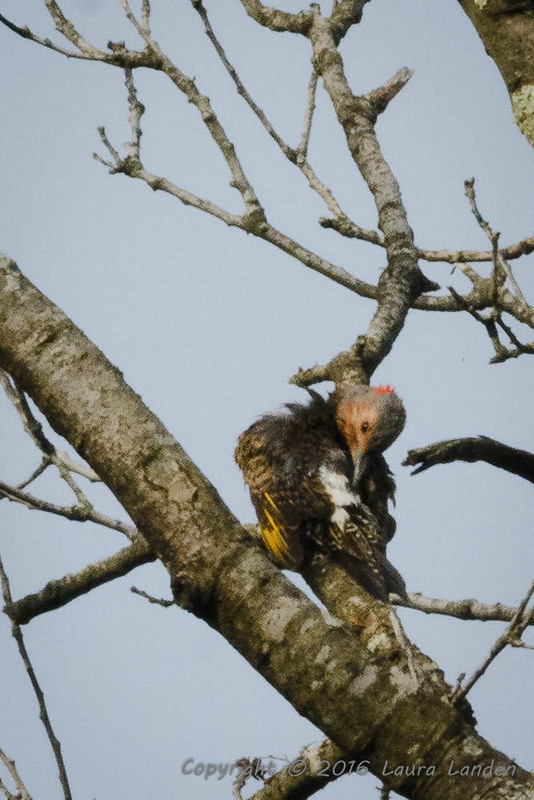 Flickers have undergone an identity crisis in the nearly 60 years I’ve been birding. 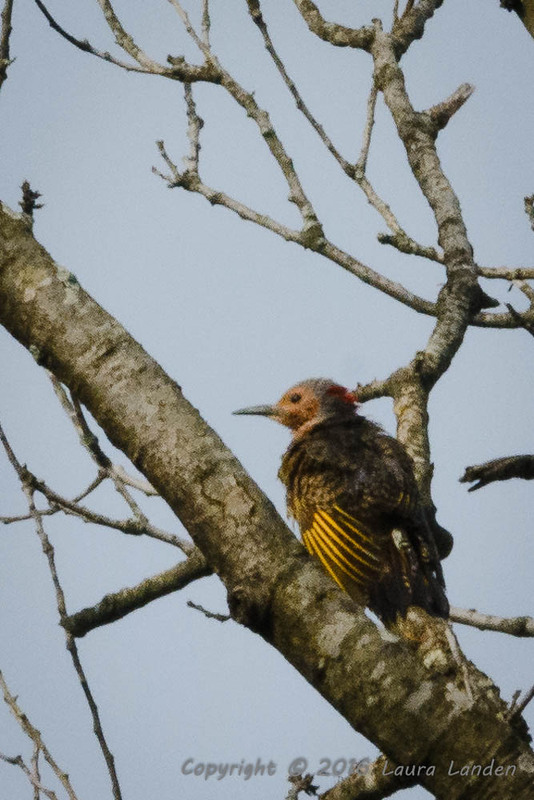 I first learned this species as the Yellow-shafted Flicker. The flicker part of the name comes from its habit of flicking its bill. The yellow-shafted part of the name is apparent in this photo. 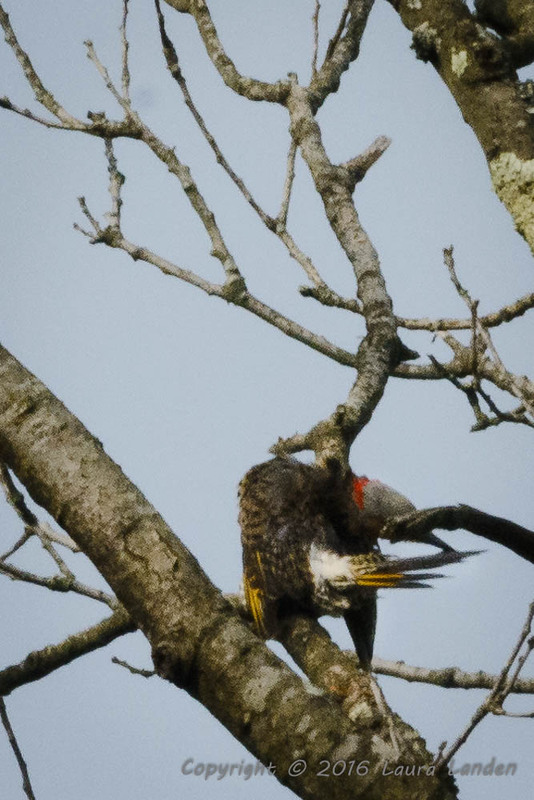 The yellow shafts are coloration in the primary flight feathers. Although I don’t currently have a picture, the underwing of the bird is a beautiful yellow, especially if seen in good light. There is another similar species, the Red-shafted Flicker, that resides in the western United States. These were originally considered separate species. One criterion that aids in speciation is whether individuals in two populations interbreed. 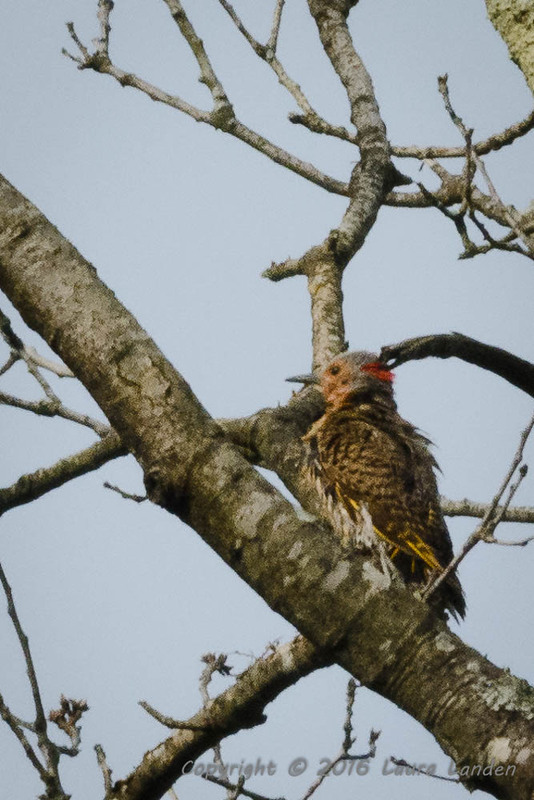 The Red- and Yellow-shafted Flickers originally were isolated from each other, so they met this criterion. However, Americans joined east and west with telegraph wires in the 19th century–1861, to be precise. The flickers followed the wire and met in the middle. Love at first sight, I suppose, as one finds individuals cross-breeding near the 100th latitudinal line. The hybrid offspring may have a mixture of characteristics. 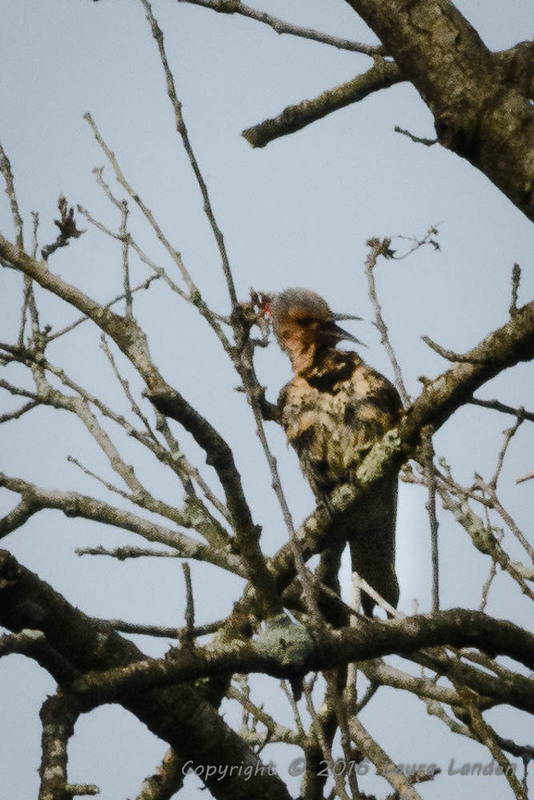 The basic differences between the two now subspecies are that the Red-shafted Flickers have red shafts, lack the red on the back of the head, and males have a red malar stripe. An interesting commentary whose details in what to look for are highly appreciated. So they eat ants but follow the wires–a low and high.